A growing sales force can be increasingly tough to manage; there are many different facets and responsibilities which have to be considered, such as demographic, products, territories and individual salespeople. Many companies have found a sales dashboard to be very effective for keeping track of everything, but if your dashboard is poorly designed, it will hinder users more than help them. In the same vein as my previous article on Marketing Dashboards, this is a case study of a well-planned sales dashboard created using Target Dashboard, with a breakdown of the design and chart layout. You’ll learn how to take the principles from this case study and apply them to your own dashboards, and not simply how to make a carbon copy of this one. Of course, the effectiveness of your dashboard depends on the KPIs you measure (check out this great article for tips: https://socialmediatoday.com/colleenfrancis/1437546/importance-kpi-measuring-sales-success ). The sales dashboard in this case study is designed to communicate sales KPIs for four members of a team and the two products they sell. While this scale is a little smaller than what most businesses will be used to, it is more manageable to analyze. I’ll break down this dashboard by the individual charts, clockwise from top left. 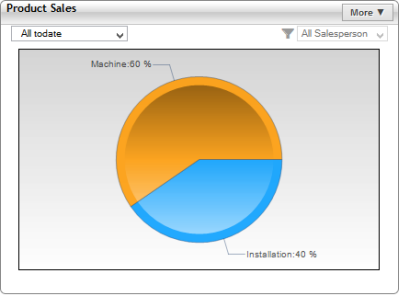 You’ll have noticed that there are three similar column/line charts at the top of this dashboard. However, these three charts show totally different KPIs. 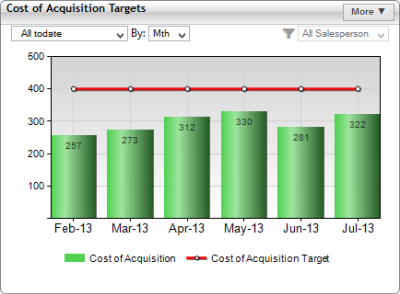 The first of these shows the total Cost of Acquisition over each month, along with its Target Value. This simple chart is very effective for managing the Costs of acquisition for the sales force because each column is easily comparable to both the target line and the other columns. 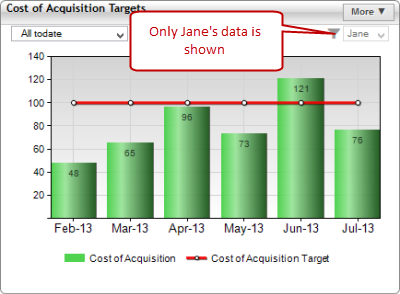 This lets decision makers easily compare costs to other KPIs (such as sales value) and determine if they are too high. 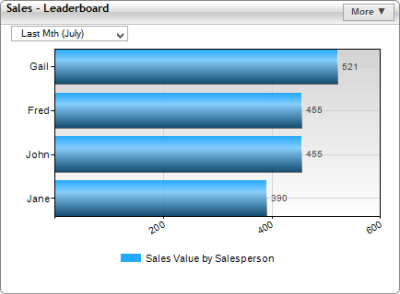 This chart is the centerpiece of the entire dashboard, as it shows the most important KPI in this dashboard, Sales value. Many other KPIs are compared to sales to gauge their effectiveness (such as the Cost of Acquisition KPI above), so having sales in the middle of the dashboard for easy reference makes sense! 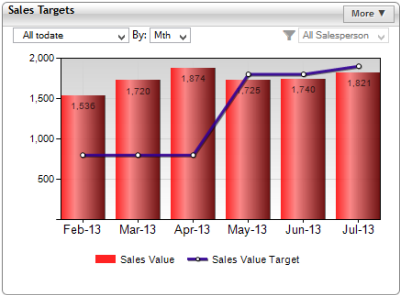 You can get more information from our Best Practice Guide on how to display targets in a sales KPI dashboard. This chart is also designed to be filtered by individual salespeople for comparison. The ‘date’ dropdown menus on the left of the chart are also great for uncovering hidden trends. For example, displaying the sales data in quarters instead of months could show a different, meaningful trend. 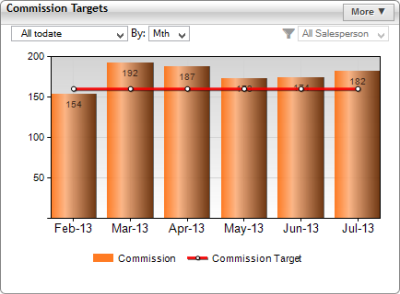 Again, this is a column/target line chart, and it shows the total Commission awarded each month. So far, each of the three charts shown has had the same functions, but contained different KPIs. The reason for this is because all three charts can be group filtered, letting users select a salesperson from a master dropdown, which changes all three charts automatically. This allows evaluation of each salesperson at a glance, which is very useful for decision makers with little time for in-depth analysis. Doing this in Target Dashboard was incredibly easy, and you can implement it in your own dashboards too. This bar chart is designed simply to let decision-makers see who is doing the best out of all the salespeople in the sales force. Each sales person is listed in descending order of sales achieved. Not only is this useful for quick assessment, but if this dashboard is displayed on a screen in the sales office, it allows salespeople to see who is doing the best, and fosters a competitive spirit. As mentioned at the beginning of this post, dashboards are effective for management because they display data in one place, where it is easy to access and analyze. The scorecard epitomizes this, as it contains a lot of information, but doesn’t confuse users. This scorecard contains sales information again, but this time, each salesperson is displayed alongside each other. This means that you can get a side-by-side comparison along with the individually filtered KPIs. There is also color-coded information on Targets and the difference between the two most recent months. The color coding lets users immediately see the status of each salesperson’s KPIs, allowing quick but effective decision making. Though it looks complicated, this scorecard was relatively straightforward to create in Target Dashboard. You can see how this sales scorecard was created here. Finally, we have a Pie Chart for which divides the total number of sales by product, and shows the ratio of each product sold. While categorical charts do not show trends, this is useful for discovering if a particular product is selling more than expected, and if you should focus more resources on marketing that product. As companies grow, sales forces often do too. When a company has many salespeople, even more products and different sales territories, it can be very difficult to manage all of this information to make better business decisions for your company. This is where a sales dashboard with meaningful KPI data is almost essential. This case study has shown how a carefully-considered sales dashboard is built, and why each chart provides users with the tools they need to improve performance. 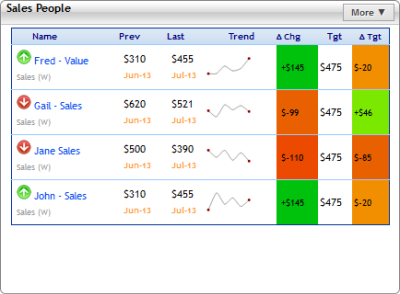 Are you looking to create a sales dashboard for your company? Target Dashboard can make this very easy for you! Contact us now to see how we can help you achieve your sales goals.